Before I sit, Josh Larson is careful to make one thing clear: “This is a game about Ryan and his wife’s four-year-old son, who was diagnosed with terminal cancer two and a half years ago,” he explains. And then this: “He’s still alive." I look around; Ryan Green has already slipped out of the room. I hesitate, then nod. I take my seat at the rickety desk and put on a pair of expensive noise-canceling headphones. The game is called That Dragon, Cancer. The desk – I wish we’d had a better desk for them, actually – is located on the first floor of Unwinnable’s furnished, three-story mansion, which we’ve rented for this year’s Game Developers Conference. Tonight every room is full of developers and their games. We’ve given That Dragon, Cancer its own entire bedroom. It’s the largest bedroom on the first floor; it even has its own couch. I am surprised. I didn’t have much to do with organizing this event (I’m not much of an organizer), so everything surprises me. More than one colleague has told me to come to this room. One told me to come to this room first, another told me to visit it last. I am about to become very, very surprised. I am searching the screen with my cursor when I remember the demo is supposed to end with the words “thank you.” And I realize I’ve just heard these words, and I take my hand away from the mouse and squirm out of the expensive noise-canceling headphones, and now I am staring at Josh Larson. Josh is here – was he always here? – with a clipboard and pen. He’s going to take my feedback. I think he’s been taking my feedback. I give Josh Larson my design notes. I am clinical with my thoughts and suggestions. I answer Josh’s questions. I answer yes, and I am explaining why, and this is when it finally catches up with me. I burst into tears. I don’t think I’ve ever played a videogame that takes place in an ICU before. Actually, do you know, for a few years and right up until six months ago, I spent a lot of meaningful time in the ICU. And wow, you really got every detail right! I can’t believe it! There’s the armchair. And it is! It is always too small! And rubbery. Here’s the phone right next to it, of course. The bed is over there. The bathroom is a room attached to this one, and then there’s another sink counter way over here, where you religiously wash and sanitize your hands. There’s the salmon-pink, kidney-shaped basin sitting on the counter just to the sink’s left: maybe it’s supposed to be a bedpan, but we always used it for vomit instead. Everything is just right, just the way I remember it. And then there are those great big windows – there are always those great big windows – and if it weren’t for those big picture windows, you’d never know the time of day, since the ICU is always so dark. That moment really struck me, seeing out those windows and realizing it’s still daylight. Oh. Have you ever heard of something called “ICU psychosis”? Write that down, look it up later. But okay, it happens to not only the patients themselves, but also to their loved ones. You not only lose track of what time of day it is, but also what day it is, what week it is. Time doesn’t work right anymore. There are audio and visual hallucinations, too, sometimes. You know that whiteboard, where they write down what day it is and the nurses’ hours? That isn’t really for the nurses, you know. It’s for you. Oh, that’s something you left out, the whiteboard. Something else struck me – sorry, I’m kind of harping on this one moment. Okay. So when I’d click on the windows, the camera would whirl, and suddenly it leaves the first-person vantage, and the camera swoops around outside the window to stare into the building back at me, and I’m standing there looking out the window, and it’s a real Portal moment, you know, where you see yourself for the first time? So when I look in at myself, I see Ryan Green standing there instead – Ryan, the man who was only just here in the room with us – and I can see his shape and form and his glasses and his beard. And then, and only then, I remember I am supposed to be Ryan. Later I was describing that Portal moment to Ryan Green – this convergence of game and cinema and prose and autobiography – and just how meaningful that moment really was, and I said something like “it proves there really are some stories that can only be told through the medium of games.” Then I added, “I think you’ve really achieved something here,” and I said that last thing out loud and I felt so, so sick. In the game, you click through the ICU, feeling around with your cursor for any sort of narrative relief. Sometimes relief does arrive, in the form of a white scrawl, an almost-handwritten prose-poem scribbling itself against the ICU. Sometimes, though, it seems you’ve finally run out of options. Your son is crying out in pain. There is nothing you can do. 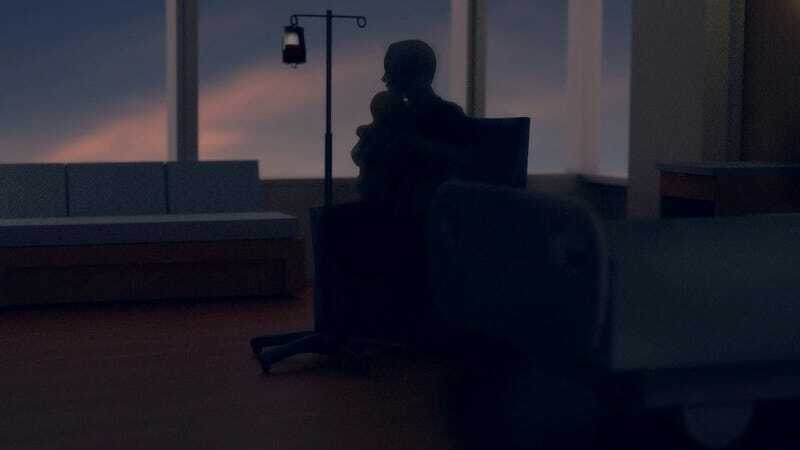 That Dragon, Cancer positions itself as an adventure game, which by design implies all the flaws and failings built into a point-and-click adventure game. You fall into these cyclic, helpless loops of action, clicking on this hotspot and that one, fumbling for anything to alleviate your, Ryan’s, son’s cries – cries that start out gut-wrenching, then quickly turn into something more persistently awful, something you’ve got to quell as quickly as possible. It hurts on every level. To get to all the hotspots on one side of the room, you have to repeatedly seat yourself in the too-small armchair near your – Ryan’s – son’s bed. And, ah, that’s how it actually goes. You keep sitting down and surveying the room, looking for just one new thing to try to do. That’s how it really, really went. And at some point the game stops cold. Now there is only one parser command on the screen. This is how it really, really went. Ryan tells us, in an early in-game voice over, how at first this whole medical odyssey was “an adventure.” He was, he imagined, “a hero.” I heard him say that, and I thought how brave it was to just come right out and say that, and my stomach folded in on itself. The very first time, my mother was supposed to die. She was supposed to die, and we succeeded instead. She survived several times after. For just under a year I was needlessly cavalier. I do remember what it felt like to be the hero. I also remember what it felt like to get so, so tired, which was a long time after I’d stopped being afraid. Ryan Green told me he’d wanted to include some sort of prose refrain. The game, in many ways, is a hymn, a song of praise, but I told him a refrain might be overkill. I told him players will always fumble at the same couple of objects in the room, and those objects can always respond with the same piece of text, and in a way, that could become the refrain, if you could just anticipate what the player will reach for. No, I told him, you don’t need to artificially include a refrain. Maybe. I don’t know. I told Ryan I have limited experience with cancer. I told him about my mother, who died of something else, but it, you know, it took a long time. Then Ryan asked me what my favorite thing about my mother was. “Oh,” I said to him. And then I told him something. It was a pretty big something. And I concluded, “I’ve never told anyone that before,” and that was true, and it is still true. I tell Josh I tried to make a game once, in Twine, and I only ever showed it to a few people, but in it there is no narrative direction; the player just circles hopelessly. There is no narrative hope. ” – the person still dies, no matter how long you take, no matter what you do.” I barely manage to work these words out. This isn’t constructive criticism at all. It is hopelessness, hopelessness in the face of Josh Larson and Ryan Green’s hope. and she’s gone, she’s gone, and now I have all this love and no place to put it. I carefully take the headphones from around my neck and set them in front of me. I look at him, and then I stare down at my lap, and I realize he’s right. For twenty minutes I’ve been in another place – in its own fucked way it was safe there – and now I’m back. I nod. This is admittedly a pretty audacious effort, to invent an entire game narrative about this one event that – how can I say this in a gracious way – hasn’t transpired yet. Yet. This is an ugly truth, but look. This is probably coming. I’m sorry. This is a game about something that is only inevitably coming. But it’s coming for all of us. I like poetry. That Dragon, Cancer is entirely made up of poetry. An old poetry professor of mine is waiting to die of some rare blood cancer. The wonderful thing about his certain-death cancer is, he could die tomorrow, or he could die at ninety. “Certain death” is incredibly silly that way. What was it e.e. cummings said? It was some line of poetry. How did it go? It went something like, “for life’s not a paragraph. And death I think is no parenthesis.” I have no idea what it means; I just like it. I was confused. Wasn’t there anything else to do? I scanned my cursor across the ICU. I nodded and took the headphones off, and then I looked for Josh. Jenn Frank is Unwinnable's editorial director. Her writing has also appeared at 1UP, Vice Motherboard, GameSetWatch, Jezebel, the New York Times, and in Kill Screen Magazine. She lives with a miniature schnauzer. Follow her on Twitter @Jennatar. Learn more about That Dragon, Cancer at its development blog. This post was republished with permission.